The Serbian-born American inventor and electrical pioneer Nikola Tesla has become a hot property over the past couple decades, regaining something of the national recognition he enjoyed in his prime in the early 20th century, but this time as a counterculture hero. In addition to physics units, rock bands and electric cars being named for him, Tesla’s alternating-current work, his dream of free energy for all and his prescient warnings about the folly of burning fossil fuel have made him a symbol of pure science leveraged for the common good, an inventor acting for noble aims amid the rampant greed of his Gilded Age compatriots. 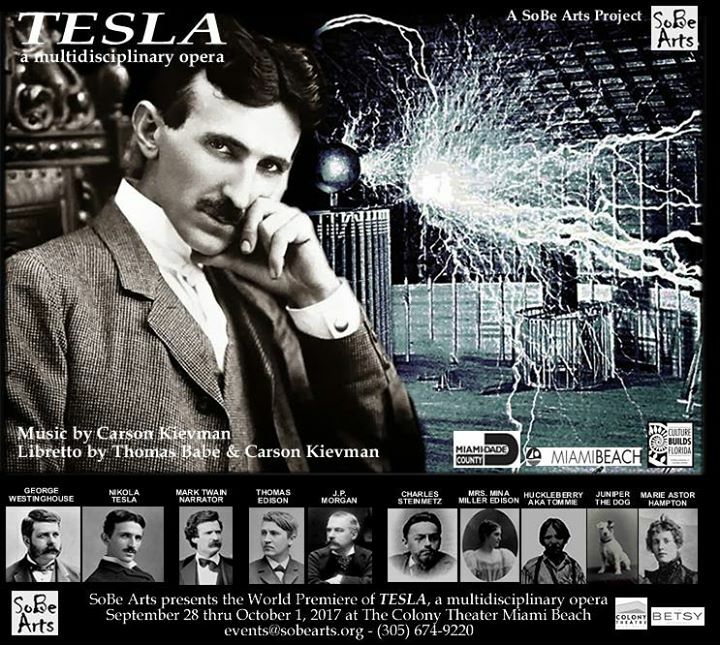 The Miami Beach-based composer Carson Kievman has been interested in Tesla for more than 30 years, and this Thursday, his SoBe Arts nonprofit will present the world premiere of his opera on the subject, called simply Tesla. For Kievman, the story of Tesla, his remarkable series of inventions, his devotion to his work and the tragic arc of his later life are highly personal. Kievman, a Los Angeles native whose body of work includes extensive music for the theater, has been presenting his operas at SoBe Arts roughly annually for the past five years. All of them have been projects long in the making that finally were revised for presentation at SoBe’s former home on Washington Avenue (the city has reclaimed the buildings and is giving them a major restoration). They have included Hamlet (2012), a new version of the canonic Shakespeare play; Fairy Tales: Songs of the Dandelion Woman (2014), a story of mental illness and spiritual intoxication; and Intelligent Systems (2015), a futuristic mediation on outer space and parallel civilizations. At one time the composer-in-residence for the Florida Philharmonic, Kievman has been interested in environmental causes for decades, writing his Fourth Symphony in 1998 on the subject of biodiversity and the crisis in the world’s ecosystems. The previous operas were presented in workshop form in the SoBe Arts’s black-box Little Stage Theater, but Tesla will be presented in a much more formal venue, the 417-seat Colony Theatre on Lincoln Road. While the transition from a tiny space to a larger one has been “a significant challenge,” it also gives the opera a higher profile for its premiere performances. There will be four performances of the work, Thursday, Friday and Saturday night, and Sunday afternoon. It also will be available as a live stream Friday night for $25 — but not in Broward or Miami-Dade counties — through www.tiltedglobe.com/tesla. The genesis of Tesla dates to 1986, when it was suggested to Kievman by Paulette Haupt, the founding artistic director of the Eugene O’Neill National Music Theater Conference. “I didn’t know anything about him, and no one else knew anything about him, either,” Kievman said earlier this month. “The first thing that struck me about him was the experimental factor about him, and I thought, ‘Wow, this is some really far-out stuff’” that would lend itself to a similar musical approach, perhaps with electronic sounds and other unusual elements. “But my whole thinking about Tesla completely changed as I got more interested in his life, what he experienced and what he did,” Kievman said. Tesla, who was born in 1856 in a Serbian enclave of Croatia in what was then the Austro-Hungarian Empire, has often been called “the father of the Electric Age.” A brilliant student, he came to the United States in 1884 to work with none other than Thomas Edison. After partnering with another industrial pioneer, George Westinghouse, on an alternating-current electrical system (as opposed to Edison’s direct-current system), he demonstrated it at the Columbian Exposition in Chicago in 1893, following it two years later with the building of the first hydroelectric power plant at Niagara Falls that powered the city of Buffalo, N.Y. Since then, AC power has been the worldwide standard. His other inventions include the Tesla coil, a transformer circuit that allows the wireless transmission of electricity at high voltages, and which proved useful in applications such as radio and X-rays. His lifelong dream of wireless electrical transmission over long distances has so far proved unachievable, but Telsa also is credited with a long series of discoveries that have applications in the fields of radar, remote control and robotics. Consumed by the ambition of distributing energy freely worldwide from a giant tower, he gave away his lucrative patents and royalties to Westinghouse in order to bring the idea to fruition. It ultimately was unsuccessful, and none of his subsequent projects had the same impact as his work with AC power. Never married, he lived as something of a recluse in various New York hotels, where he was a familiar sight in the city, feeding pigeons. He died there in 1943 at age 86, penniless and largely forgotten amid the noise of World War II by the world at large (though his funeral was a public event at which Mayor Fiorello LaGuardia gave the euology). The opera covers the bulk of his life from his arrival in the United States — with a suitcase, 14 cents in his pocket and a letter of introduction to Edison — to a scene near the end of his life with his beloved pigeons. We are introduced to the action by Mark Twain (who was a friend of Tesla’s), and we see moments from his life such as the fire that destroyed his Colorado Springs laboratory. There also is a set feature in which an AC motor slowly rises from the floor, ultimately turning into a Tesla coil. The libretto for Tesla was written by Thomas Babe, a prolific playwright for Joseph Papp’s Public Theatre who died of cancer in 2000. He and Kievman did a great deal of research in fashioning the opera, searching out books and primary sources about the scientist, who was a well-known person for most of his life. Two scenes from the first version of the opera were workshopped at the New York City Opera’s Vox Festival in 2004. Kievman returned to the work after staging Intelligent Systems in June 2015, and decided the libretto needed some reworking. “The more I learned, the more I realized that my focus in this piece is different than when I started,” he said, and after revisions with the help of Mark David Needle, who assisted with the libretto of Fairy Tales, he completed the final version of the score in April 2016. Tesla is being mounted with much larger forces than Kievman’s previous black-box productions. He’ll be able to draw on an orchestra of 25 people for his nine-member cast and six-member chorus. Starring as Tesla will be the baritone Kenneth Mattice, a strong-voiced singer who has appeared in the title role of Kievman’s Hamlet, and as the Bank Examiner in Fairy Tales. Baritone Trevor Martin stars as Mark Twain, Timothy Stoddard is Westinghouse, Chris Vettel is Edison, Kyle Albertson is J.P. Morgan, and Ben Werley sings the role of Charles Steinmetz. Courtney Miller is Mina Miller Edison, Anastasia Malliaras is Marie Astor Hampton, and Emily Solo sings the role of Tommie (aka Huckleberry Finn). The show will be directed by Jeffrey Marc Buchman, with musical direction by Mary Adelyn Kauffman. Choreography is by Rosa Mercedes, and set design is by Stephan Moravski. Climate change and its attendant sea-level rise is a major concern for Miami Beach, and that makes the message of Tesla even more pertinent, Kievman said. “It’s getting very serious, and I’m very passionate about telling this story, because he (Tesla) still has the answer to this problem. And certainly it will draw attention to these issues,” he said. And presenting those issues through the medium of musical theater helps to get it across. “One of the things that I learned during ‘Intelligent Systems’ and other works that I’ve done is that it’s easier for people to absorb information that they need to know to change their lives through music. It’s easier to absorb, and they don’t feel like they’re being lectured at,” he said. The opera’s message of corporate greed crushing a man of science gives the work its motivational energy. “The real focus is a man who is on top of the world, living on Park Avenue, all the famous people are hanging around with him and partying and all that stuff, and he realizes that burning fossil fuels is going to be destructive to the planet. And he was making millions of dollars and he gives away all his patents and all his royalties to George Westinghouse. He doesn’t want anything to do with them, in order to do something he thought was really important for the planet,” Kievman said. “And because of that, they destroy him,” he said. The story has drawn a different kind of music from Kievman, who began his compositional career in the late 1960s and early 1970s, which were a time of enormous experimentation. That aesthetic was still part of his toolbox when he first began writing Tesla in the late 1980s. “My first approach to it was much more avant-garde, more about mixed media sounds and electronics, and sounds coming from synthesizers as well as exterior sounds. And we still have a little bit of that, but I put more of that stuff into the orchestra,” Kievman said. “But I changed my complete approach to what I was doing here when I realized what he had done, what he had sacrificed of his personal life to create this stuff. It brought me to tears … I just felt it down to my core, and the kind of music I created for it was very different, different than anything I’ve written, really, much more depth, much more emotional and expressive,” he said. “There’ll be something for everybody in this one,” he said. TESLA premieres at 8 p.m. Thursday at the Colony Theatre, 1040 Lincoln Road, Miami Beach. Subsequent performances are at 8 p.m. Friday and Saturday, and 3 p.m. Sunday. Tickets are $45-$60 and are available at www.colonymb.org/tesla or by calling 800-211-1414. The opera also will be live-streamed Friday night at www.tiltedglobe.com/tesla to viewers outside Miami-Dade and Broward counties; tickets are $25. For further information, visit sobearts.org.